Photographers have an interesting dilemma when choosing a bag for long hikes. Camera backpacks are great at holding cameras, but they tend to be poor choices for comfort on long hikes. For some people – those who rarely need to trek with their camera equipment – a traditional camera backpack may be more than enough. For landscape and travel photographers, however, or those who need to carry their equipment longer distances, technical hiking bags tend to be the only option. The issue with these bags is that they aren’t made with photographers in mind, meaning that gear access and tripod attachment is quite difficult. 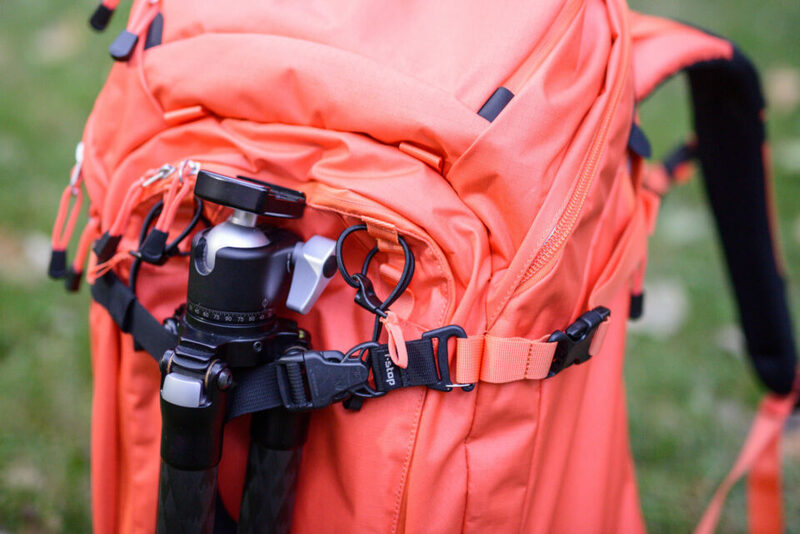 One of the companies trying to fix this problem is F-Stop Gear, who makes trekking-style backpacks with separate compartments for camera equipment. I have owned the F-Stop Loka UL since it was first released, and it has never disappointed me. So, when F-Stop announced their newest line of Mountain Series backpacks, I was excited to see some of the improvements that had been made. 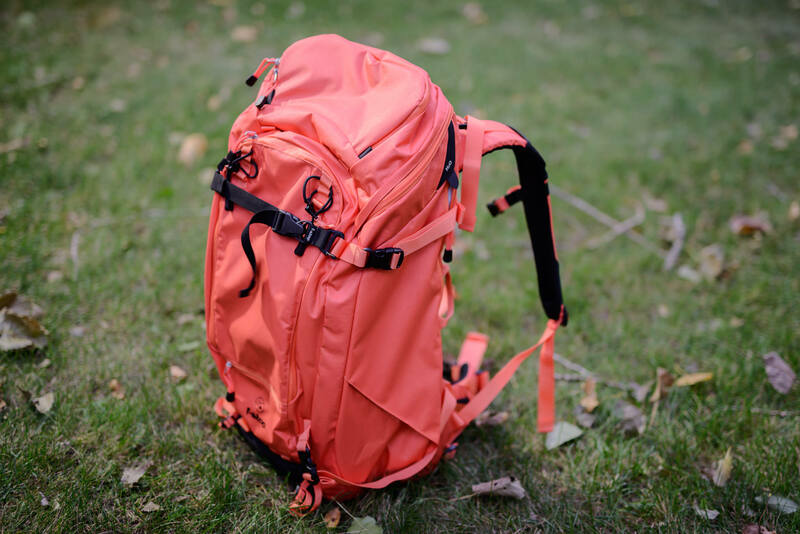 In this review, I will take a look at the brand new Sukha bag – at 70 liters, F-Stop Gear’s second-largest backpack. Dimensions: 27 inches tall, 14 inches wide, and 12 inches deep (68.6 x 35.6 x 30.5 centimeters). External “shovel pocket” along the entire front of the bag, including a tiny drainage hole at the bottom. Two Velcro pockets within the shovel pocket – one which extends the entire length of the pocket, and one smaller mesh section. Materials: Water resistant canvas exterior, rubber along the bottom for mud and water protection. 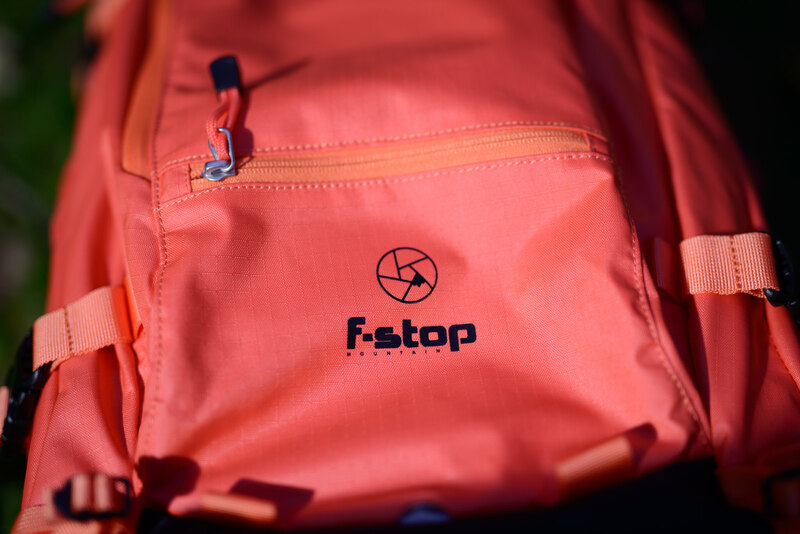 The most significant change that F-Stop introduced in their newest Mountain Series is the fabric of the bag. Although the old F-Stop bags were very water resistant – I hiked through more than a few rainstorms with mine – the new series is a major improvement. This bag isn’t technically waterproof, but it’s about as close as you can get. I would have no reservations about using the Sukha, or any of the new Mountain Series bags, in the craziest of rains. At 70 liters, the Sukha is larger than any of the old Mountain Series bags, the largest of which was 63 liters. The Sukha is a huge bag, to be sure, but sometimes you need to carry a huge load. I definitely don’t recommend filling the Sukha completely with camera equipment – it could reach fifty pounds (23 kilograms) without a problem – but this size is perfect for a multi-day hike, where you need to carry a full camera kit with a lot of food and clothing. A bag this large is not for everyone, but long-distance hiking photographers typically want a bag in the 60-80 liter range to carry all their equipment. The new Mountain Series bags also have the benefit of extra pockets, which was one of my few issues with the older F-Stop Loka UL. The largest of these new pockets spans the length of the bag on either side. These side pockets are large enough to hold additional lenses – I can fit my 70-200 f/4 without a problem – or perhaps a jacket and some food. The Sukha also adds an improved harnessing system, which makes the sternum strap more comfortable and adjustable. Alongside the structural changes, the Sukha also adds a new color to the F-Stop lineup. 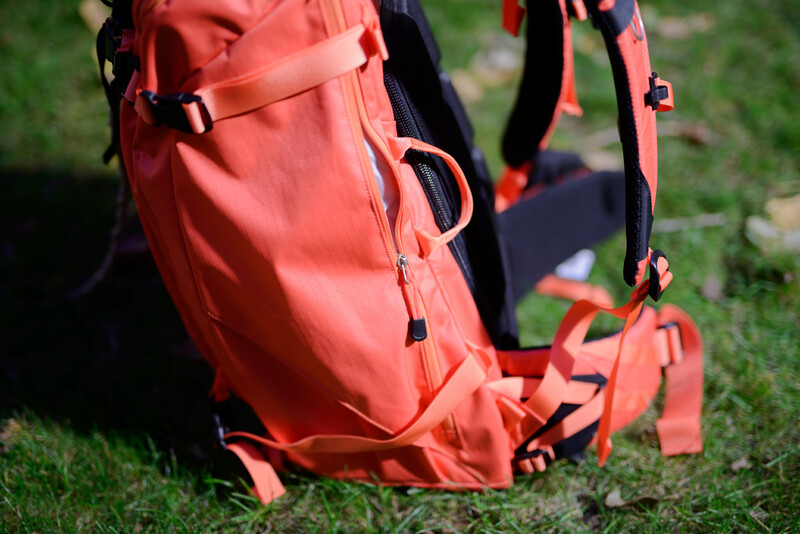 The old Mountain Series bags were offered in tan, black and light blue; the Sukha (and the entire new Mountain Series) adds the option of sunset orange, or “Nasturtium.” I can see that some people might not like this new color – it is very orange – but I’m a fan. I have a tendency to leave my bag on the ground and wander a half-mile away, then forget where I put it. The new color fixes this problem! If you don’t want to stand out as much, I recommend the black or tan colors instead, which are much subtler. One reason that F-Stop gear backpacks stand out from the crowd is that their bags have a back panel made to access your gear. This opening zips across the entire backpack, opening between the two shoulder straps and down the length of the bag. The most crucial benefit of this section is the ease of accessing all of your equipment. In a traditional hiking backpack, it would be easy for your camera gear to get buried at the bottom of the bag, since the only opening is typically at the top. With the Sukha – and any F-Stop backpack – the rear compartment makes it easy to get to any part of the bag. Although some other camera backpacks have this feature, I have yet to find a technical hiking bag that offers such a panel. Here, F-Stop has a clear advantage over the competition. Another crucial benefit of the Sukha is its comfort for long-distance hiking. Many landscape photographers have begun to buy technical hiking backpacks rather than camera-specific bags, simply because camera bags are terrible at carrying weight. I can say with certainty that the Sukha is the most comfortable camera backpack I have ever worn (along with the Loka UL) – near the level of a traditional hiking bag. I also love the improved water resistance of the Sukha backpack – for all intents and purposes, this bag is fully waterproof. I certainly don’t recommend dunking it in a lake, but the Sukha will protect your gear regardless of the weather. The canvas used in the construction of this bag is quite thick, and water tends to bead on its surface. Plus, the bottom of the bag is constructed out of a waterproof rubber, so you can put your Sukha down in the mud without water soaking through to your gear. Speaking of which, the fabric and zippers on this backpack are wonderfully-built. I am picky about zippers, and I must say that these are the best I have ever seen. The zippers are large, extremely smooth, and fully waterproof. This might not seem like a big deal, but the goal of a good camera bag is to make life easier for the user. These zippers accomplish their goal. The fabric, too, is extremely well-made; I don’t think this bag will ever fall apart. The top opening to the main compartment. The Sukha is a great bag on its own, but it is made to be used with some additional accessories. The most important of these is what F-Stop calls an ICU, or Internal Camera Unit. 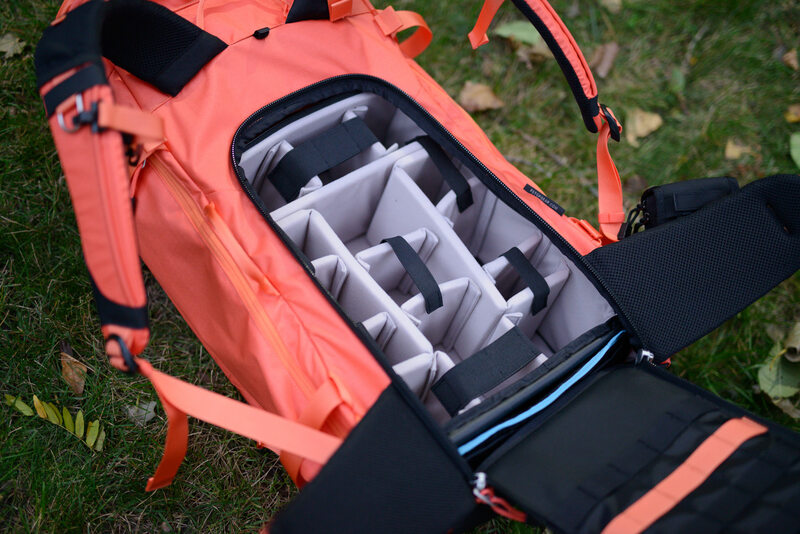 An ICU is a bag within your bag – it holds camera equipment in a way that is easy to access through the back panel, and it includes several dividers to separate your equipment. F-Stop makes several sizes of ICU for the Sukha. Personally, I use the Small Pro ICU and the Large Pro ICU. Together (one on top of the other) they both fit in the bag, and I can choose just one when I need less gear on a given shoot. The Sukha is also large enough that it fits the new “Tele Master” ICU, which can carry lenses up to an 800mm f/5.6 in size. 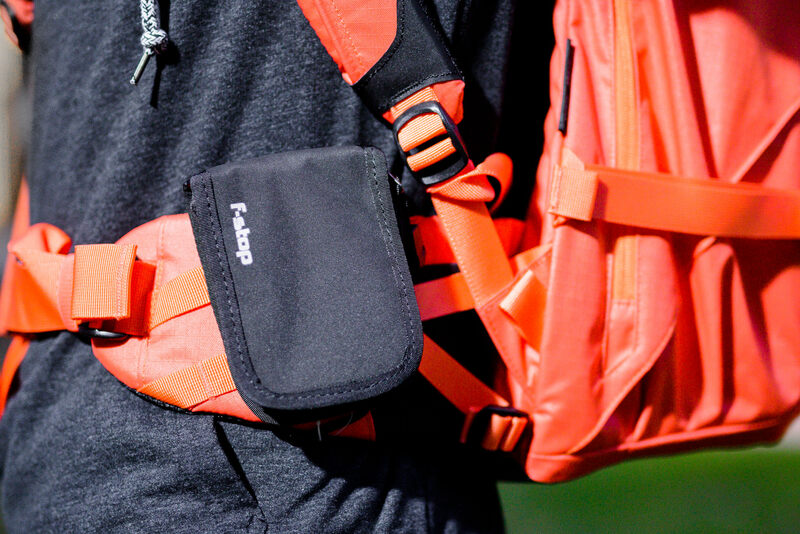 F-Stop sells their ICUs in conjunction with their backpacks, so you have the ability to design a system that works for you when you buy the bag. I also use F-Stop’s Gatekeeper straps on my Sukha, and I have been quite impressed with how sturdy they are. I hate attaching my tripod to the side of a backpack, since the weight shifts so much. However, most backpacks don’t have the option to hang a tripod from the center, which doesn’t leave me with many options. F-Stop’s Gatekeeper straps are a great solution to this problem, even if you are using a bag that isn’t from F-Stop. These straps have a hook on both ends, and they can hang a tripod when stretched across the bag. Gatekeeper Straps to hold a tripod. The other F-Stop accessory that I have been using recently is a little pouch called the Digi Buddy. This accessory is quite small, but it serves my purposes very well. It attaches firmly to the side of the hip belt, adding an additional pocket for lens caps and batteries. The Digi Buddy is lightweight, so it isn’t a bother to use. It may not be the most obvious accessory for a backpack, but I have found it to be extremely useful. I am happy to say that the F-Stop Sukha has very few crucial drawbacks – fewer than most any bag I have used in the past. However, there are some of areas where the Sukha isn’t optimized in the same way a traditional hiking backpack would be, and it is worth pointing out these possible areas of improvement. The most significant drawback to me is the low breathability. The Sukha’s wonderful back panel is a double-edged sword – despite its usefulness for accessing gear, the panel makes it impossible for F-Stop to add a spacing mesh between the bag and your body. Unfortunately, this means that the bag is less breathable than some other hiking bags. The Sukha actually is better in this regard than is my F-Stop Loka UL, but it is far from perfect. Another issue, at least for me, is the lack of a side pouch for water bottles. I understand that F-Stop removed these mesh pockets to give more room for the zippered compartments on the side of the bag – which also can hold water bottles – but it is quicker to grab a water bottle from a pouch than to swing the bag to the side and unzip a compartment. That said, the addition of zippered pouches was a wonderful decision – I love the extra carrying space. I just wish that F-Stop had found a way to include mesh pockets as well, possibly even at the expense of smaller zippered sections. Also, I think that F-Stop could have saved some weight on this bag by using a neoprene hip belt and shoulder straps. This isn’t a major problem so much as a suggestion for the next Mountain Series, but it seems to me that the straps could be thinner than they are without sacrificing comfort. I am used to the neoprene-like straps of the F-Stop Loka UL, which I actually find more comfortable than the ones on the Sukha, and they certainly are lighter in weight. Lastly is the price. Such a well-specified backpack isn’t cheap, unfortunately, although its price definitely will be justifiable for certain photographers. The standard Sukha bag is $299, with extra costs for ICUs and other accessories. This puts the Sukha firmly in the territory of other high-end hiking backpacks, and it may be more than most people are willing to pay for a bag. However, if the Sukha is taking the place of two bags for you – a camera backpack and a technical hiking backpack – then its price may be easier to justify. On both sides, the Sukha eliminates a water bottle pocket in favor of a large side compartment. If your only need for a large camera backpack is to hold equipment on small walks between locations, this certainly isn’t the bag for you – you certainly can find far cheaper options. However, if you hike or walk long distances with your camera equipment, this is one of the best 70-liter bags on the market. Not only is it remarkably comfortable for a camera bag, but it also is built to withstand any conditions you encounter. The real question for landscape photographers is whether to choose this Sukha or a traditional technical hiking backpack. Despite the usefulness of the Sukha for hiking, there are some areas where a traditional backpack may have an advantage – breathability, for one. However, for photographers, the flexibility of the Sukha is hard to ignore. Not many hiking bags allow for easy access to camera equipment, and even fewer can carry a tripod without blocking major compartments. The number of pockets on the Sukha also is unusual in the world of hiking backpacks, where most bags have only a few extra sections – I count a total of eleven additional pockets on the Sukha, the smallest of which can still hold a camera like the RX100 IV with ease. Lastly, the extreme quality of the Sukha’s fabric means that this bag could last for decades without falling apart. In short, if your main use for a large backpack is to carry camera equipment on hikes, the Sukha is one of the best bags on the market. No hiking-specific bag will have been designed with photographers in mind, meaning gear access almost certainly will be compromised. If you are willing to work with the Sukha’s few shortcomings – most significantly, the $299 price – then this could be the perfect bag for you. In my opinion, F-Stop Gear has created a winner. Purchase F-Stop Gear through this link. Unfortunately, at 70L, this bag is too large to fit comfortably under an airplane seat. You could fit it overhead on most planes, although you may have to gate-check the bag, depending upon the airline. This is why I leave most of my camera equipment in the ICU – if I need to gate-check the bag, I can remove the ICU and use it as a carry-on. ha I didn’t know that ICU is zipped and covered to carry it separately! Can you post a section on airline travel on this review, this could help someone! I would love to post a separate section for air travel, but there are so many different airlines that it is hard to give good, general information about this bag that applies to them all. If you or anyone else has any specific questions, though, I will happily answer them as best I can! HI I spoke to F-stop and the internal frame is the same size as the smaller Tilopa. That means if you compress it and do not overpack it can be very similar size as Tilopa externally interesting Dilemma Maybe get this and have best of both worlds. They do not recommend for airline travel simply because it can be bigger if you use it to the full. Hello, your review certainly makes this bag seem a great investment. I would like to know if you would recommend it for traveling? I like to go on trips every now and then and have had to take my camera bag and a small suitcase for my clothes and things. What I would really like is to find a bag that can eliminate this necessity. One that can keep my gear safe (and inconspicuous and available!) and still have room for a couple of changes of clothes, my bits and pieces and even the capability to carry a tent! I have been looking for a while and have not really found anything suitable. I’m not sure this behemoth is out there but it would certainly make my life easier! Oh, did I mention it would need to be modestly priced too (sort of)? I hope you can help in this search for my holy grail of camera bags! I do recommend this bag for traveling — it sounds like it will work quite well for your purposes. It’s important to note that this is a large bag, so you may need to do a gate-check on smaller airplanes. However, if you use an ICU for your camera equipment, you can take it out of the Sukha at the gate to carry onto the plane. I also would suggest getting the Small Pro ICU for what you want to do (link: . This would leave about 50 liters free for clothes, food, etc. The Small Pro ICU can fit a DSLR with three moderately-sized lenses (about 24-120mm size), so you may need to get a larger ICU or another Small Pro if you have more equipment. Just a further word on airline rules: The typical rule in the US for a carry-on is 45 total linear inches (114-115 total cm), with the most prominent restrictive dimension typically being a length of 22 inches. As such, this bag would be too large in theory (53 total linear inches and a length of 27 inches). In my experience, however, airlines are much, much more willing to ignore the limits for a backpack than a suitcase, if you are carrying it on your back (or better yet, casually slung over one shoulder as if it weighs nothing). If the bag is not over-stuffed, you also typically can jam it into that evil metal bag “checker” at the gate that is arbitrarily used to determine if bags are compliant. 1. US airlines tend to be more aggressive on enforcement for overseas flights. 2. Non-US airlines, particularly EU budget airlines are MUCH more restrictive. 3. Worst of all for the intrepid traveler, tent poles, many tent stakes, and hiking poles are considered deadly weapons and typically not allowed as carry-on baggage, which requires a checked bag (other potential problems include camp stove and camp tools…. of course fuel would never be allowed). Don’t even get me started on the insane notion of “lethal” tent poles…. Thank you for the helpful additions, Benji! The tent regulations are absurd. The poles on my tent are no longer than a foot each, and they are made of the thinnest aluminum I could find. A suitcase could easily cause more harm than my tent. The colour… They are kidding, aren’t they ? A few days carrying that around, and it will show every mark, bit of dirt etc….. Not for me, thanks very much. If you’re concerned about dirt/dust spots, F-Stop also makes the Sukha in tan and black. However, with the canvas-like fabric on the bag, it actually is very easy to clean (especially considering that it’s waterproof). This really doesn’t look like anything new. I’ve seen and tried several backpacks for photographers. The largest issue I’ve had is: comfort on longer hikes, not enough storage for meals, water bottles or extra clothing, and flimsy support for decent tripod. The best option I’ve found so far is to first find a daypack that is comfortable AND built for hikers (not just photographers). Then make sure it has enough space to hold camera equipment. Certainly not the best solution, BUT certainly the most comfortable way to go on a 5-10 mile hike with heavier lenses and equipment. 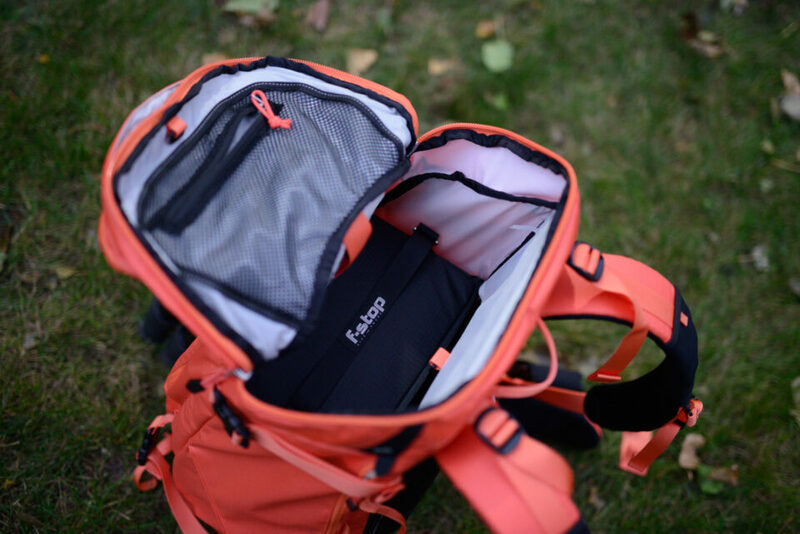 The goal of the F-Stop bags really is to be a normal hiking backpack, but with more access points for photographers. These bags are very comfortable on 5-10 mile hikes – I carried mine on two 15-mile hikes when I went to Iceland, actually. It sounds like you have quite a good setup, though. This certainly is an issue for most hiking photographers. That is quite a bit of equipment, particularly if you are going to hike for long distances. If you plan to carry everything at once, as well as other hiking equipment (food, jackets, tent, etc.) then you would need a large bag like the Sukha — in which case, the bag could be pushing 50 lbs. If you only carry one camera, 2-3 lenses, and your tripod, the smaller Anja or Tilopa bags would be enough. I bought this bag for a trip to Iceland and did a multi-day trip in Hornstrandir Nature Reserve. It was extremely uncomfortable! Despite adjusting the straps, and adjusting the weight in the backpack, the bag distributed weight into my lower back rather than on my hips. It made for miserable hiking. Just beware before buying. Since f-stop isn’t carried in stores in Canada, my only option was to buy it online and try it out. Now, f-stop won’t take the bag back so I’m stuck with an uncomfortable and useless bag that is a lot more expensive than conventional backpacks. So beware before you buy! It would be wise to do a “test trip” with a normal amount of weight right after you get the bag so that you can try to return it within their 45 day window, if need be. I wish I had. I need to tell you, Ashley, that I’m so sorry you experienced great discomfort, but from what I’ve experienced and heard, you are truly the rare exception. I, too, have the Sukha, and have done some really steep and prolonged hiking with it, and it’s carried beautifully. I have heard that the size of the bag purchased should really depend much on torso length, and I don’t want to assume that was the issue in your case, but suggest that it might have been? I’ve heard from other photographers who purchased smaller F-Stop bags such as the Anja that the hipbelt failed to reach their waists, leading to discomfort. Thanks for the review Spencer. This does appear to be a well thought-out product for most trekking photographers. I have personally come to the conclusion that carrying my camera gear on my back – regardless of how it is accessed through the backpack – is just too slow and cumbersome to access for my needs. For casual day hikes and tourist outings I love my Vanguard Sedona 51 and Lowepro Flipside 400 (which is only $50 brand new on ebay or double that on B&H), both of which operate similarly to this f-stop bag. Here are some reasons larger versions of these don’t work for my trekking needs: 1) Getting the heavy loads (often around 50 lbs with water, tent, sleeping bag, clothes, food, etc.) comfortably situated on your back requires just the right adjustments, so sliding the pack around your body to access is impractical at this weight and with the added pain of readjustment when put back in walking position; 2) It is just too slow. I often want to take out or put away my camera without stopping (only stopping to take the picture). This isn’t practical with a backpack. It sounds like you have a good method for carrying your gear! I also have used the strap-attachment technique (on my Loka UL), and it’s a great way to balance the weight of your camera equipment. I actually used the Lowepro Flipside 500 for a month or so, and I must say that the Sukha (and the Loka UL) is dramatically more comfortable. I definitely agree with you on the speed of accessing your equipment, though. That’s an issue with backpacks, and it seems like your setup is a great fix. Thanks for the review, I have been looking at bags in this size range and this looks like a good option. I’m glad you found it helpful, Monte! I own a Loka (not UL) for about 15 months and used it a lot for traveling, transporting and hiking (for hours) with my gear. Owning two ICUs (Pro Large and Medium Slope) i really love the flexibility of this backpack. That is the scary part about using a water bladder inside a camera backpack! Actually, the side pockets on the Sukha are large enough that they should fit smaller water bladders with ease. That gives you another degree of separation from your equipment in case the bag breaks, at least. Hi. We live in Australia. We used to get these bags but there was rumours having lost our recent importer that F-stop was going on hard times. Do you what the situation was there and the truth behind the rumours. As far as I know, F-Stop is doing well for themselves. I confess that I do not know much about their specific situation, though. Their new Mountain Series certainly seems popular. I’m also from Australia and I can tell you F-Stop are certainly not going through hard times :) They just changed their distributor in Australia. The new distributor is C R Kennedy (who also distribute SIGMA, Pentax, ILFORD, etc). You can ask any retail store that stocks products from C R Kennedy to order an F-Stop Bag for you. You may need to explain who F-Stop are and that CR Kennedy is the distributor, etc. Thanks. . I have taken a look at them at both Georges and Patersons. Lets see. Interesting I looked at CR Kennedy website and their bag section does not mention FStop. How odd. Do you know why? I’m using the Tilopa since 2years.. and love it. I’m looking for something little bigger… think this one will be mine..
Thank’s for the review ! I have heard great things about the Tilopa as well. I think you will enjoy the Sukha quite a bit — I am a big fan of mine. Hi there, will this bag fit on me? I’m about 184cm tall. I tried emailing Fstop but they didn’t get back to me.. I was looking into getting the Sukha pack and pairing it with the Large Pro ICU. With the Large Pro ICU how much more room is left in the pack for clothes, gears, etc…? The Large Pro ICU takes up around 1/2 to 2/3 of the Sukha’s total capacity, depending upon how much you are willing to stuff the bag. All the external pockets of the Sukha can be used to fit more clothes. If you run out of space, you always could use the ICU itself to hold some of your extra gear. Look at the fourth image in the article, with the caption “The large Pro ICU inside the Sukha.” In this photo, the ICU ends directly at the edge of the opening — everything above it is empty. I hope this helps! After a couple of months of use, I still highly recommend the Sukha for anyone who needs a big bag. What do you recommend for carrying a 1D X, 70-200 f2.8 is, 16-35 f2.8, and a 50mm 1.2. Along with possibly a Rode Videomic pro and a zoom h6. Would the medium slope be good? The medium slope should be good for that equipment, although you’re pushing it with the Rode Videomic and H6. If those don’t fit, you could always put them in one of the other pockets on the bag. I don’t have a medium slope, so I can’t be completely sure. Thanks so much for the quick response! Love this blog! Thank you for the helpful review. I was wondering have you used the F-Stop iCU in a Pelican or a Think tank Roller for storage and or travel. I have a Think tank Shape shifter but not so good for protection/working out of but great for carry-on but avoid duplication. I had thought ICU could be used in Pelican and or Roller and then transfer to Rucksack. Hi Darrell, I haven’t used them specifically in a Pelican or Think Tank bag, but I’m sure that it would work very well. I have used my ICU in other backpacks (not from f-Stop Gear) in the past with success. Do you have any comparison to the Tilopa 2015? Why have you chosen the Sukha over the Tilopa? I am currently looking forward for an f-stop backpack. Tried the Lotus, but it was too small and the shoulder straps are very thin which is not comfortable. Would you recommend the Sukha over the Tilopa? I am not hiking for several days, but I have heavy equipment and want a comfortable bag. The Tilopa is 50 liters, while the Sukha is 70 liters — the difference is pretty significant. It depends upon the amount of equipment that you are carrying, but the Tilopa will be easier to fit on airplanes if you tend to fly. Unless you are certain that you will need the 70L, I think most people would be better off with a 50L bag. You can always go to a local backpacking shop and test two bags of 50L and 70L just to confirm. I am struggling with what pack to get for an upcoming trek. It’s a four day trek, cabins each night so don’t need a tent or cooking equipment – but do need to be otherwise totally self sufficient with sleeping bag, clothes, food, etc for the four days – oh and of course my camera gear. Did I mention it is winter in Tasmania Australia? No snow where I’m going but it will be close to freezing overnight. I plan to take a Canon 6D, Canon 24-70mm & Samyang 14mm, Manfrotto 190CX tripod, batteries, filters, MIOPS trigger and other small bits like cloth, blower, etc. I did buy an Osprey Atmos 50L but once I put my sleeping bag and a case similar in size to the F Stop Medium ICU in it, there looks to be very little room left for everything else. Also there is no easy/obvious tie off points externally for either a tripod, or if I wanted to mount the sleeping bag outside (which would then give me plenty of room). I am looking seriously at the Sukha now, but unable to source in my town so can’t get a fit or an eyeball. I understand the balance between a “real trekking pack” and a camera bag, but *not* taking my gear on this trek is not an option. So keen on your thoughts on the above fit out of camera gear, sleeping bag, and clothes etc for four days and stuffing that into the Sukha – I would be practical in what I take clothing/gear wise as I’m an experienced motorcycle tourer and learnt the less is more lesson a long time ago :). I guess my main concern at this point (other than not being a real trekking bag as such) is the medium shallow ICU looks like it takes up a lot of the bags internals, but I don’t think I can get away with the small ICU with the bits I want. I do think that you would be able to take all your equipment in the Sukha, although you will need to travel with very minimal clothing! A four-day hike with camera equipment is tough no matter what bag you have, but at the very least you would want a 70L bag like the Sukha to do what you are planning to do. If you do get the Sukha, be sure to purchase Gatekeeper straps as well, or something similar from a different manufacturer. These will help you mount the tripod and sleeping bag outside your backpack. I have never tried the Sukha on such a long trek. You might find that a traditional hiking bag is more comfortable for a trip like that, although I can’t say anything for sure. You could always purchase the Sukha and return it after the trip if it doesn’t work well. You’ll need to pay return shipping, but that isn’t a horrible outcome. That is probably my recommendation. Just ordered a Shinn (80L) to go trekking in Patagonia in Autumn. F-stop bags are quite expensive – lets now see if they are worth it. Did not find many other bags, with rear acces, that have sufficient space for camping stuff as well. Seems they are a bit too focused on driving price up – you can get their gatekeeper straps only in black, except if you buy them as part of a colour kit, but then you end up spending 2x as much, and get extra zips pulleys that you don’t need. and their site price is higher than regular retail/webb photoshop prices – figure that one out. Will report back after the Patagonia trip. Have everything else ordered. Now i need to decide if the 80-400mm is enough for ‘landing the Condor’ or if I need a 200-500mm. Currently planning to take 18-80 DX; 14-24; 80-400, 1FX and 1 DX body. All this might fit in a medium ICU, and put 1 body + lens into a F-Stop NAVIN holster in ‘ready to shoot’. makes more space free in backpack. Oh, and dragging a Gitzo GT2542 along as I found the GT1545T travel series too flimsy – they move under pressure. Possible might slip a 70-200mm in as well, if I have sufficient space and face an extra 1kg to carry. Now need to find backup solution without laptop (laptop or just card-to-drive solution) and cable release preferably without batteries. In my opinion the 200-500 would be way too big and heavy to take trekking. The 80-400 should be fine for birding on a dx body. You already have an extremely heavy camera gear load as it is. How far/long is your trek? I went trekking in Iceland and after that decided that I’d never bring a spare dslr body or long telephoto lens (in my case the Sigma 100-400) again for that type of trip. Way too much weight for items that weren’t used. I had my Nikon Coolpix A (28mm equiv) and m4/3 with 20 and 60 (40mm and 120mm equiv) if my dslr died. Thanks for feedback – will keep weight in mind – also saw 200-500mm is much longer lens. likely will leave 70-200mm home – shame of the quality but as you indicate – 1 kg less to lug around. My son is doing the W trek = 150km in 10 days, but i will join him at end, probably with car, so i would do day treks, or max 2-3 days away from car while we are in Torres – might make it to Magellan street and shoot some penguins . He just left with 17kg Deuter backpack. I just got my F-stop Shinn bag, but while I found sites recommending using an ICU on its side – leaving 50% inside free for camping gear, i just found out there is no way to use the ICU standard velcro connections to attach to inside of Pack. also the zipped ICU top does not open down in that way, but sideways, which doesn’t work well. Planning to do BIF as Patagonia is know for Condor, so my idea was to take DX + 80-400mm if that gives me “more reach”. I understand it would actually be identical to my D800+80-400mm. But my idea was D500+16-80mm = walk around kit – hanging from waist or neck = not too heavy. For BIF I could do either D800+400mm or D500 + N400m ( and have 10fps) the D800 would stay in backpack, for when arriving at specific photo spots. I was eyeing up Fuji for trekking, but they aren’t that much smaller or lighter than a DX body. Just came back from North Lapland, and Nikon bodies survived the -5 to -15 Deg C very well. The batteries was another story – they run down in about 30 min outside. Have some special insulated ones that seem little bit better for freezing weather.